Most of you have probably figured out by now that I usually have a very strong reaction to the films I see. The vast majority I like, and a few of those passionately so. Then there is the much smaller percentage that I hate with a fiery vengeance. But rarely do I find a film to which my reaction is...meh. 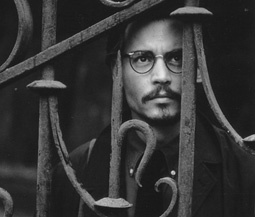 The Ninth Gate is just such a film. Now ordinarily, I wouldn’t be moved to review a film to which I had such a lukewarm reaction. But what is good in the film is laudable enough that it’s definitely worth a look-see, and it’s quite likely that other viewers will be more swayed by its charms than was I. Starring the current darling of Hollywood - and well-deserved at that - Johnny Depp as a rare books dealer and the marvelous Frank Langella as a client who is looking to verify the authenticity of a particularly unusual volume, The Ninth Gate has a number of very interesting ideas at its heart. And indeed, it is neither the concept nor its execution that left me feeling merely whelmed after viewing it. Nor is it the acting, for you’ll go far before you come across a more perfectly-matched cast, both in terms of individual abilities and inhabitation of character. And while director Roman Polanski can often be a bit too enamored of obfuscation to make for palatable film viewing, the expatriate helmer is at his least oblique here, framing some incredible shots and handling the special effects with an understatement too rare in mainstream Hollywood. So where does The Ninth Gate go wrong? Well, I wouldn’t exactly say it goes wrong so much as it just doesn’t go quite right. The plot concerns a book called The Nine Gates of the Kingdom of Shadows, purported to have been co-authored by the Morning Star himself. Legend says it contains secrets that not only confer great power upon the person who unlocks them, but spells to conjure Satan and open a pathway between this world and Hades. The über-rich Boris Balkan (Langella) has one of what is believed to be only three copies of the book, and enlists Dean Corso’s (Depp) help in locating the other two, confirming the authenticity of all three, and then comparing Balkan’s volume with the remaining two in order to ensure the completeness of his tome. As most everyone who’s ever seen a horror film has already deduced, Balkan is not being honest with Corso, for there is a hidden reason he wants all three books brought together. And as Corso tracks the other two, he begins to learn more about the volume’s origins and secrets and starts to piece together what Balkan is planning, or at least what Balkan thinks he’s planning. As Corso continues on the trail of the two missing copies, he delves deeper into the book’s history, and soon finds himself being drawn further and further into the world of the occult. An avowed skeptic, Corso discovers that sometimes not believing is more dangerous than believing, and as the peril grows, the handsome compensation which was his original stated interest in the quest becomes less important to Corso than unlocking the mysteries which he can no longer rationalize away. Surprisingly, that more-detailed-than-usual synopsis, while laying out most of the film’s plot, really only scratches the surface of the picture itself. For like life, the journey taken by Corso -and by proxy, the viewer - in The Ninth Gate turns out to be its own reward, and none of the four or five predicted endings you’ll probably entertain during the course of the movie will come to pass, or at least not completely. And the plot has the advantage of being somewhat unique; many horror films are made about conjuring demons and seeking supernatural powers, but none quite follows the path of this one, and the direction the film ultimately takes is most decidedly the road less traveled. Now for those Johnny Depp fans out there who still haven’t forgiven me for dissing their hero over the abomination that was From Hell, I may partly redeem myself by saying that I quite enjoyed Depp here. Quite honestly, I watched the film originally for Frank Langella, having developed a big crush on the man after seeing the ’79 Dracula. But in the end, although I enjoyed Langella’s performance immensely, it was Depp who impressed me the most. His penchant for taking roles that interest him rather than those that might bring him the biggest paychecks or greatest celebrity has not only resulted in those two things eventually coming to pass, but has also created an eclectic resumé of which the most iconoclastic indie actor could be justly proud, and his Dean Corso is a nuanced performance that travels the character's gradual paradigm shift from skeptic to (sort of) believer in a completely convincing manner. Then again, maybe the reason I didn't find The Ninth Gate an engaging movie is that it is a long, long film. An exceedingly long, long film, clocking in just shy of two-and-a-quarter hours. And you are repeatedly made aware that this is a long, long, bloody loooooooong film. Not through any fault of the acting nor writing, nor even entirely due to the leisurely directing; it’s just deuced difficult for a film that doesn’t have a whole lot of action sequences to carry two-plus hours without the viewer realizing that the film is two-plus hours. While The Ninth Gate does have its share of stunts and effects, it is at heart a more thoughtful film, with a great deal of sleuthing, deductive reasoning and many, many philosophical discussions. Many, many, many philosophical discussions. Which, come to think of it, is likely another factor in the viewer realizing that this is a long, long, long, bleeding looooooooong film. In all, while I liked The Ninth Gate well enough, it’s not one I’d recommend you run, not walk to the local video emporium to rent right now. But when you find yourself in a reflective mood and would like a film to match, or you’ve got some time to invest and are looking for something out of the ordinary that will engage your mind for many, many minutes, then The Ninth Gate is certainly worth a gander. Lord knows you could do much, much worse.